On the 6/9/2017 Stuart O’Mahony, Michael Fennelly, Eddie Moroney and Anthony Shoer left St Cronans in Roscrea for the long awaited visit to Thomond Park . They had the full stadium tour of the museum and a film plus a visit to the pitch side, the dressing rooms and post-match interview area. The spectacularly interactive museum showcases the proud heritage of Munster rugby and features an impressible range of memorabilia. 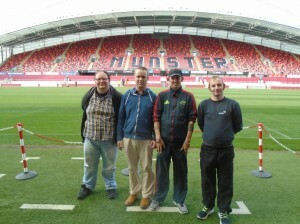 ‘We are Munster’ portrays the tradition and history of the club and the unique bond it shares with its loyal supporters. After the tour the boys went to the Parkway Shopping Centre for some lunch a great day was had by all.